Marcia, Linda, Karen and I had a glorious hike yesterday to Castle Rock. We parked at the trailhead located next to Needles Country Store, 22 miles north of Durango on Hwy 550. The trail starts out smoothly with wide, gentle switchbacks for a mile or so, then climbs more steeply up to a meadow containing an old cabin owned by the Piccolli family. Shortly afterwards, we turned right on an unmarked trail and climbed very steeply through snow fields and gullies to our lunch spot. Not bad! The cliff we sat upon looked a lot like the cliffs on the far right of the photo. 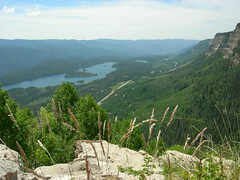 You can see Electra Lake and Hwy 550 in the valley below. 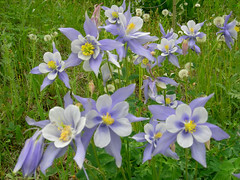 On the way down, I snapped a photo of gorgeous blue columbines along the trail. What a great hike!